As Melburnians wake to one of the chilliest mornings this year, and a trail of pretty hot-air balloons floats across the city skyline, over 1,000 homeless men, women, children and families have faced a night exposed to the elements or in their cars. 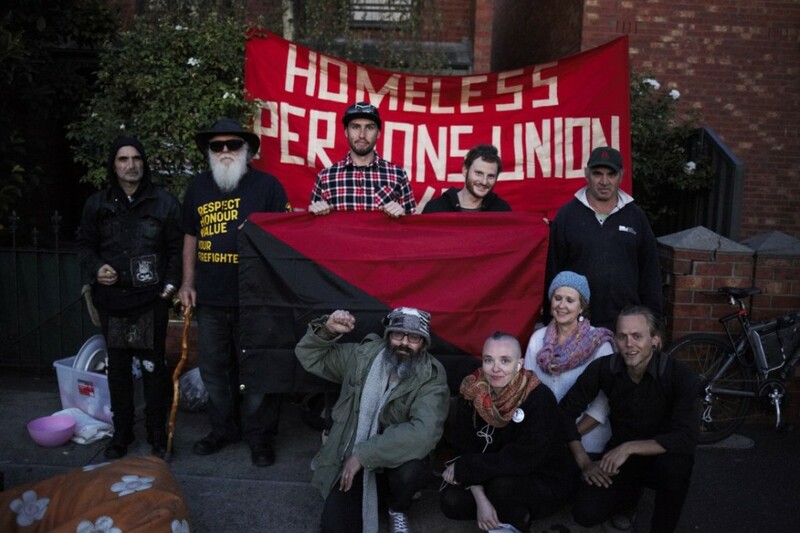 Standing in solidarity, members of the HPUV and homeless community have begun occupying another empty residential property on Bendigo St, Collingwood, overnight. 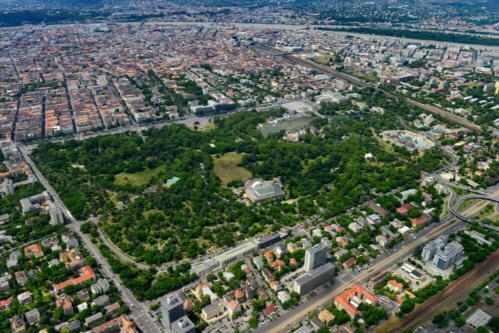 They continue to demand clarification on the ownership and management of six long-term vacant residential properties on this street. It was revealed to the demonstration late yesterday afternoon that a commercial relationship exists between the state government and Noble Knight Real Estate concerning property numbers 16 and 18 on Bendigo St, Collingwood. Today the demonstrators once again call on the Andrews government for transparency regarding their relationship with Noble Knight Real Estate as it pertains to any of the empty properties on Bendigo St, and they demand to know why these properties have been left abandoned for over 1 year amidst a homelessness and public housing crisis. They will continue their campaign until they receive these answers in the name of the 23,000+ homeless Victorians and the 35,000+ Victorians languishing on the public housing waiting list. The protesters will once again provide a free community breakfast at the site this morning and are encouraging all community members to join them in their demand for clear and accountable government throughout the day. 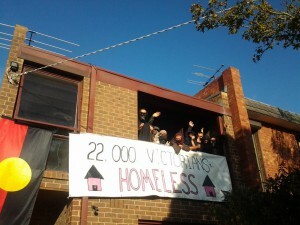 After a long-fought day, protesters have successfully occupied an empty domestic property on Bendigo St this morning. This is despite being informed late yesterday afternoon, and after weathering a 3-hour holding pattern conducted by Victoria Police officers and an anonymous party of three, that their occupation of 18 Bendigo St, Collingwood, constituted an act of unlawful trespass on private property. Noble Knight Real Estate spokesman, Travis Sanders, acting on behalf of his unnamed ‘client’, informed the demonstrators of this, alongside a Senior Sergeant of Victoria Police. However, earlier in the day, with the assistance of Yarra City Councillor Stephen Jolly, the demonstrators received confirmation, via a title search, that the six empty residential properties they sought ownership and management clarification on still remain in the ownership of the Victorian government. Noble Knight Real Estate representative Travis Sanders and the Victoria Police Senior Sergeant declined to provide any clarification to the demonstrators on the relationship between the real estate and the government. 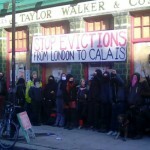 An update on the court case of the 8 friends arrested for squatting an empty homeless shelter in Calais. 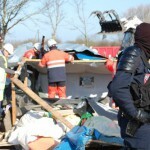 Today, the trial scheduled to take place at the court in Boulogne-sur-Mer was postponed until Friday, April 1. All 8 had accepted to be tried today, under the comparution immediate (fast track procedure). 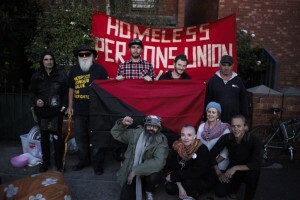 Early this morning a coalition comprising members of the Homeless Persons Union Victoria and Melbourne’s homeless community began demonstrating at a number of empty properties on Bendigo St, Collingwood. The properties are among those that were compulsorily acquired by the former Napthine government for the now defunct East West link. 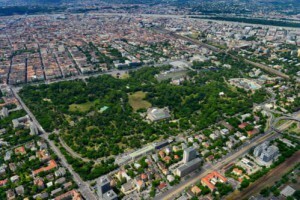 The demonstration seeks clarification on issues surrounding the ownership, management and occupancy of these empty, publicly-owned properties. The lack of transparency has led to confusion within the homeless community. Six months ago there were media reports that 20 properties were transferred to the Collingwood Football Club’s ‘Magpie Nest’ program, a partnership with The Salvation Army, to house the homeless. A spokesman from Magpie Nest claims that all properties transferred to their management have been filled. 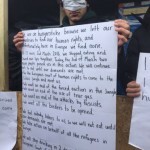 In light of this, the demonstrators call on those responsible to immediately provide clarification on who owns and manages the remaining empty properties. It is unjustifiable that these dwellings remain unoccupied with a Victorian winter approaching. 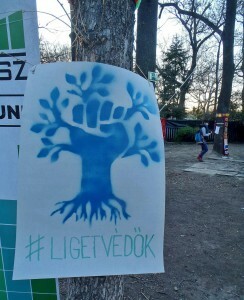 “We are here in support, in sympathy, in bringing our experiences, but certainly not to bring advise. The weekend of 26th to 27th March, a call-out for decentralised actions against the Socialist Party was launched by the anti-airport movement. 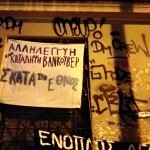 Late in the evening of March 13th 2016, the Vancouver Apartman building which is squatted for a little over a decade came under attempted arson attack, when a Molotov cocktail landed in front of a door on Mavromataion Street.